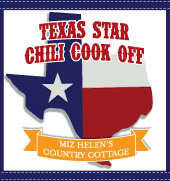 Welcome To The 5th Annual Texas Star Chili Cook Off! I am so excited to kick off the 2014 Chili Cook Off and to welcome you here today. We love a good Chili Cook Off here in Texas and I sure hope that you enjoy this one. Of course there are a few guidelines and some prizes so lets take a look. To qualify for the prize you must: choose at least two: follow me on Google Friend Connect, Google Plus, Twitter, Bloglovin, or like my Facebook Page and leave a comment telling me which you are doing. The post must be linked back to the Chili Cook Off, link as many bowls are you like. The first, second and third prize will be awarded to the qualified person based on the total number of page views for that bowl of chili. The winner will be announced on Wednesday November 5, 2014. It would be really nice if you would Tweet the Cook Off, put it on Face Book, Google Plus or any other social medium, this helps get more votes for YOU. Thanks Miz Helen for the Cook Off. I am following you with GFC, Bloglovin and Pinterest. Thanks for hosting us each year. Looking forward to all the new chili recipes. Have a great day! Thank you for chili cook off, I follow g+,tweeter, & pinterest. Chili is a favorite at our home, cold weather or hot, we have it at least once a week, just cook a big pot (I like trying different recipes-and find a hugh variety in blog world) and some cornbread and we are set. Good Morning Miz Helen, Oh dear, I have made a mistake. I was late joining your party and I mistakenly added my link to the Chilli Cook Off..... and I do not know how to remove it. I am hoping you are able to remove the link as Peaches with Amaretti is nothing like Chilli. I was happy to move your wonderful Peaches with Amaretti over to Full Plate Thursday, it was no problem and I was happy to take care of it. Thanks so much for coming to the Cook Off. Hi Miz Helen, I entered my chili recipe. Thanks for hosting this fun, annual event. I'm already a follower of yours and "liked" you on FB long ago. oh wow! so much chili! everything looks so good!